Last week Pat and I hosted a Fourth of July party. We wanted it to be as casual as possible: bring something for the grill, maybe a side too; come swim and play yard games; we'll do fireworks when it gets dark. Easy peasy. I think it went well. Since we were hosting, I made three sides: my 'famous' corn casserole, a super basic potato salad (it was really just potatoes, mayo, mustard, relish, and seasonings), and this amazing pasta salad. 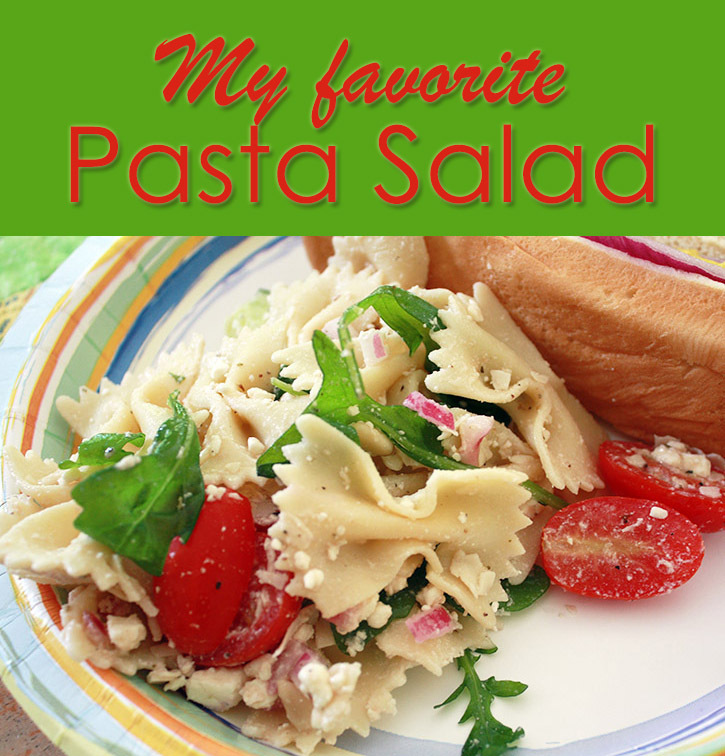 I hardly ever make or eat pasta salad because Pat's not a fan of cold pasta. When he goes out of town, I tend to make a batch of this and eat it for DAYS as a meal or a side! Since we were having a summer party, I figured a cold salad would be perfect. Here's how I made it. Complete instructions are at the bottom. Boil your pasta of choice until al dente. Make sure not to overcook it. You don't want mushy pasta in your salad. Drain and rinse it with cold water when it's done. 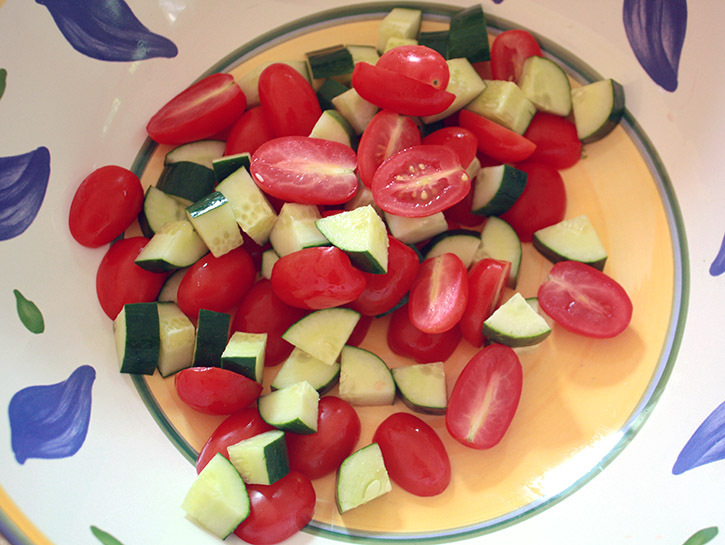 While that's going, slice grape tomatoes in half and quarter chunky cucumber slices. I would normally peel the cucumbers first, but I knew that there would be some non-cucumber eaters at the party so these needed to stand out from the rest of the salad. 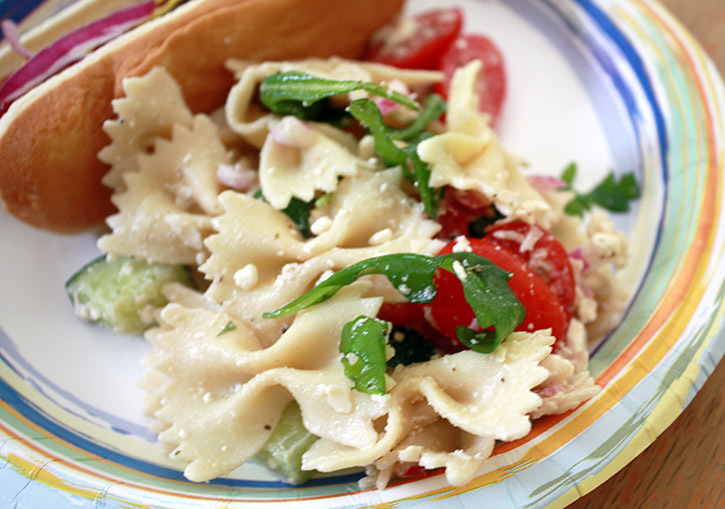 Toss in your feta and Parmesan cheeses, pine nuts, and red onion. You could just use feta, but I have a real love affair with cheese so I can't help but add all the cheese. Also, you're welcome to toast the pine nuts. I wasn't feeling like fussing with the oven myself. 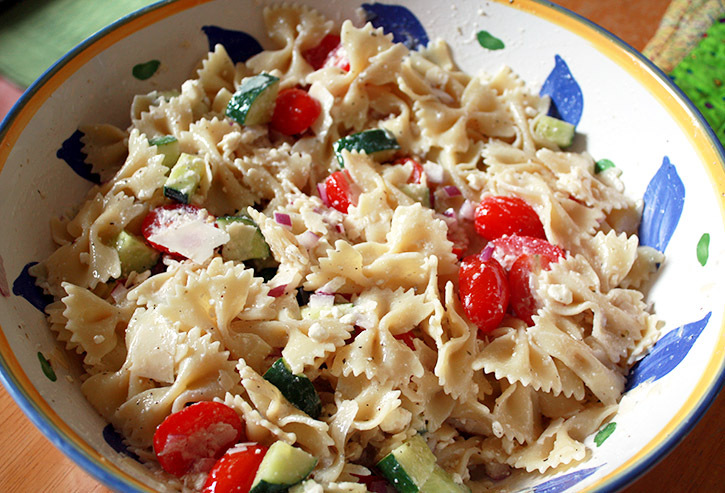 Dump the pasta in with the veggies, and pour the dressing over it all. Stir the whole thing together, cover it, and chill it in the fridge. Now, I have another confession to make. I have a thing for arugula. When I made this pasta salad for the first time (as a pot luck dish back in the fall), it was the arugula that drove me to do it. Wash and rinse some arugula (in a salad spinner thing). Put it aside until you are ready to serve the salad. If you put it in too early, it could possibly wilt. I just stick it in a zip-top baggie until I'm ready for it. As I made the salad, I knew there were guests coming that wouldn't eat certain ingredients. One was allergic to pine nuts, some don't like cucumber, onion is an issue for another. I figured if they didn't like the ingredients; they didn't have to eat it. I could have it ALL TO MYSELF! Whahahahaha! (that was my evil laugh). Anyway, the salad did get eaten, some was even taken to other homes. I did have a little left over just for me though. Yay! Before I give you my recipe for it, I need to tell you that the whole dish was inspired by this Arugula Pasta Salad with Tomatoes recipe from Little Spice Jar. 1. Boil pasta until al dente. 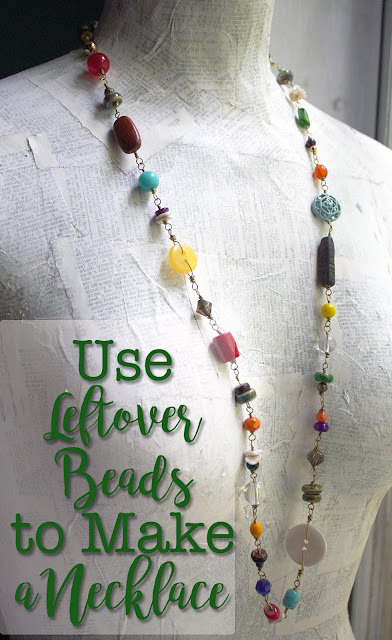 Drain and rinse with cool water. 2. 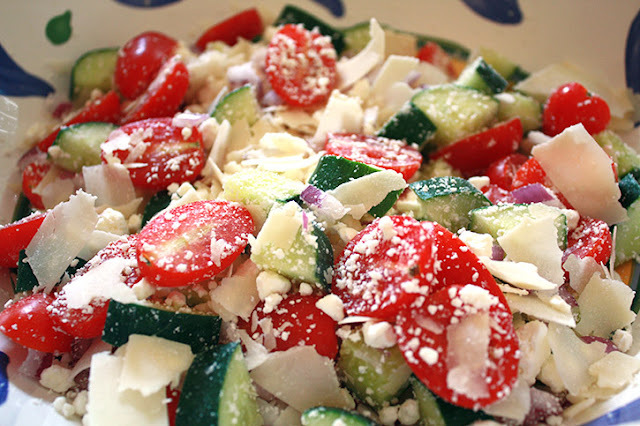 Chop and combine in a large bowl the grape tomatoes, cucumber, red onion, pine nuts, feta, and Parmesan. 3. Mix together dressing ingredients. 4. 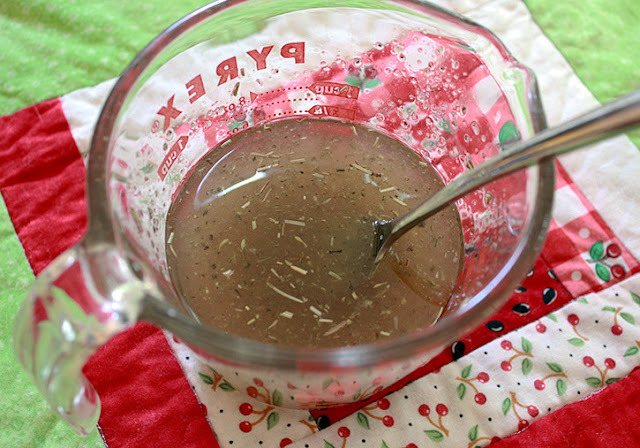 Add pasta and dressing to bowl. Toss to combine. 5. Chill bowl in fridge. 6. Wash and rinse arugula. Place in baggie in fridge until ready to serve. 7. 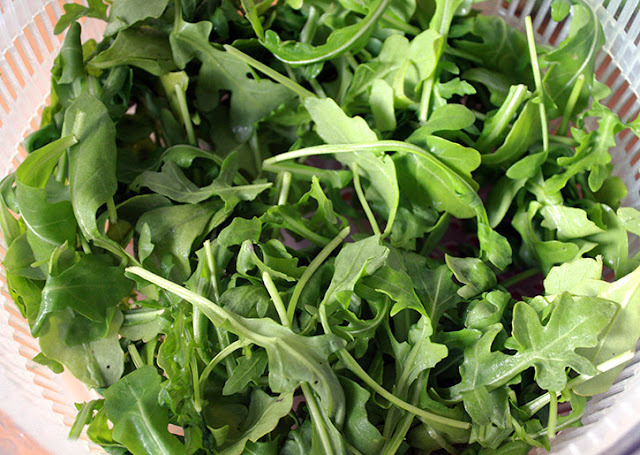 Toss arugula into bowl and enjoy! Feel free to add any ingredients you think this needs and more or less of anything. I'm happy with it as is but did consider adding broccoli (had it not gone bad). I could also see grilled chicken or shrimp in with it. And, while I think it's a perfect dish for summer, I can eat it all year long! Do you have a favorite 'summer' recipe? 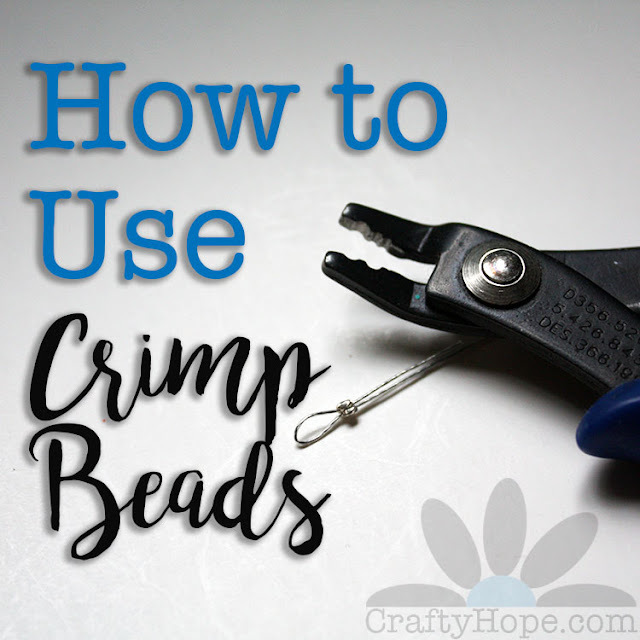 I'm linking up this recipe at the Link Party Palooza 150 on Lil' Luna. wow - that looks so delicious! I love pasta salad in the summer ... I could eat it for pretty much every meal! Thanks! It totally is. I LOVE it!! Let me know if you try it and if you have anything you would add or take out. Thanks for hopping by!